While I love and cherish every minute I get to spend in the theatre, it’s also a lot of hard work – more than one might think. Back in May and early June, I was putting in about 12-15 rehearsal hours a week working on A Funny Thing Happened on the way to the Forum at The Cassidy Theatre as I mentioned before. And that’s aside from the hustle and bustle of working a part-time job, taking voice lessons, trying to maintain a social life, spending time with family, and everything else that comes along. After the show closed on Sunday, June 25, instead of auditioning for another summer production, I decided it was time to take some time away from the stage to recenter. And the training and practice never stops, mind you. I wake up every single day with one goal: To continue to grow as an artist and in some way work to refine my craft. However, stepping off of the stage for the rest of the summer was something I felt personally necessary. With college auditions coming up this fall, it’s important that I don’t wear myself too thin. So until school is back in session, it’s time for some summer fun! This week, I am writing from my family vacation in Gatlinburg, Tennessee, where we are staying for a week in a cozy cabin in the beautiful Smoky Mountains. It’s absolutely beautiful here! The area is an absolutely perfect balance of tourist areas and a beautiful scenic view of the mountains in the Great Smoky Mountains National Park. You feel secluded and cozy. Yet, you’re never more than five minutes from every restaurant you could ever want, and not to mention the huge variety of tourist attractions. It’s a perfect vacation destination! One of my favorite encounters – It was bright and early this Monday morning, and I was heading outside to grab something from the car to bring back inside the cabin. Who do I meet along the way? This baby black bear! 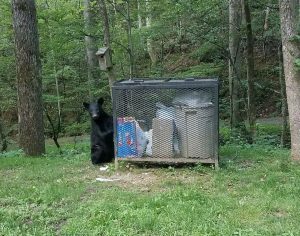 I wanted so badly to pet it and tell it that it was a good bear, but I used my common sense and stayed away. It was definitely hard to keep away from that cute face, though! 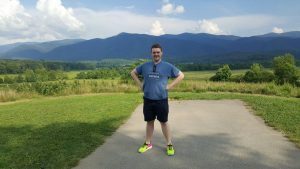 Here’s me on a visit to Cades Cove, a scenic auto tour in the heart of the national park. It offers tours of historic buildings from early settlers and this breathtaking view of the Smoky Mountains! This stunning area never fails to leave me in awe of its natural beauty. Of course, you have to take advantage of the thrills offered by the various local tourist attractions. 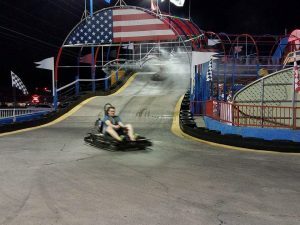 So the family and I buckled up and headed out onto the speedway in our go-karts! We had a blast together. I like to tell myself that I came in first place despite the fact that I most likely (most definitely) did not. Having this time with my family is always something that I treasure. With theatre, school, extracurriculars, a job, and all the other inevitable factors of life, it can be hard to find time for anything at all. So I’ve decided to take advantage of this vacation and the rest of the summer while it lasts; notice the little moments, laugh with the people I love, and create memories that will last forever. I look forward to returning to BHS in August. I definitely miss my theatre and choir families like crazy! That first time back on the PAC stage is always so refreshing, and going back into the choir room feels like coming home. However, until then, I’m going to make the most of summer vacation. From here in Gatlinburg, Tennessee, I hope that everyone is having and continues to have a great summer! And please be sure to check back for more blogging before school resumes!! Me playing The Baker in BHS Theatre’s 2017 musical, Into the Woods. Greetings, one and all! My name is Tyler Martin, and I’m going to be a senior at BHS next year. I’m so excited to share my Brunswick experience with you! I’m a pretty actively involved student at the high school. I’m a member and the new student director of the BHS Choir Department, a member of National Honor Society, and also a thespian in the BHS Theatre Department. As I start to share my experiences with you, I’m sure you’ll begin to see that I am truly a student of the fine arts. I have a love for music and a profound passion for performing theatre and musical theatre. 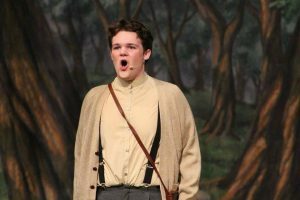 Outside of school, I study voice privately, perform at many Cleveland theatre companies, and expose myself to as much theatre as I possibly can! I’ve been a theatregoer since the age of ten when my mother took me to see national tour of The Phantom of the Opera at Playhouse Square in Cleveland. I was so taken back by the experience that I wanted to hop onto the stage and give it a try… So I did! And now, here I am, a performer of four years now with a resume of fifteen theatrical productions. Some of my favorite credits include; Shrek: The Musical (Lord Farquaad) at BHS Theatre, The Crucible (John Proctor) at BHS Theatre, The 25th Annual Putnam County Spelling Bee (Leaf Coneybear) at The Cassidy Theatre, and Beauty and the Beast (Beast) at Fred Hargrove Young Artists. I am so grateful for all of the opportunities I’ve been given, especially here at BHS. Our music and theatre departments strive for excellence and have earned great credibility. They provide wonderful instruction and experiences that allow student artists like me to study, explore, and refine my craft. I am so thrilled to have the opportunity to provide you with some insight to my life as a performer and musician at Brunswick High School! Before I sign off, I would like to share that I am currently taking the stage at The Cassidy Theatre where I am playing the role of Hysterium in Stephen Sondheim’s A Funny Thing Happened on the way to the Forum! The show runs June 9-25, with performances on Friday and Saturday at 8pm, and on Sunday at 3pm. Visit www.cassidytheatre.com for ticket prices and box office information.